I’ve not indulged in chocolate much over the past few years, nor had much of a sweet tooth in general, but I’m gradually developing a taste for sugar. When I saw this amazing chocolate bread with chocolate chips in Waitrose this morning I knew I needed to taste it. 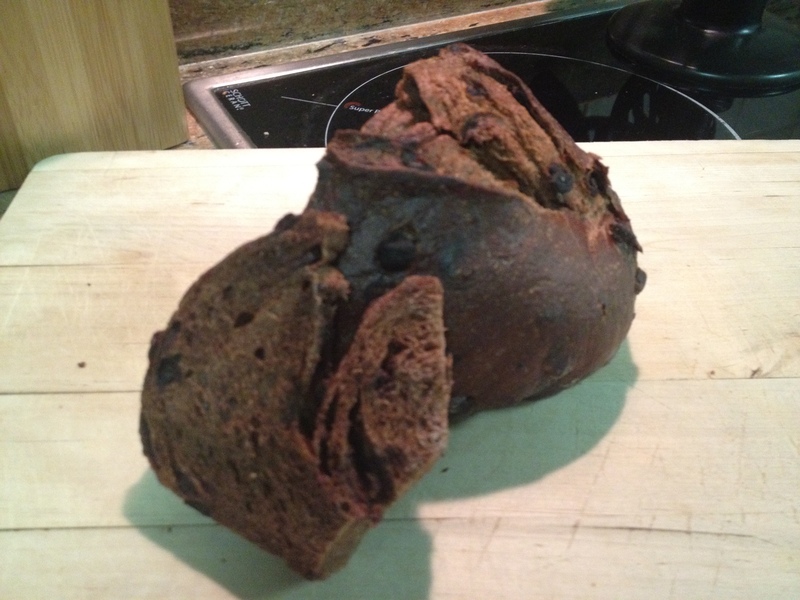 The chocolate chips are dark and rich, but the bread is not too sweet, a very adult alternative to cake. Pretty soon after it landed in the kitchen I decided I needed to make my very first bread and butter pudding. A Google search for chocolate bread pudding, landed me with nothing involving ‘chocolate bread’; just bread with chocolate added, so I adapted a recipe from Martha Stewart, adding my favourite flavour du jour, coconut. I think it tastes divine. Gooey, chewy and crunchy all in one mouthful. But don’t take my word on it alone. I sent a dish off with some friends tonight, so await their verdict on this creation too! In a medium saucepan, combine milk and butter; place over medium-low heat, stirring occasionally, until butter has melted. Tear bread into 4-5 pieces per slice; spread evenly in baking dish. In a medium bowl, whisk together eggs, sugar and vanilla. Whisk in warm milk mixture until combined. Pour over bread. Bake about 25 minutes until pudding has puffed up and has set. Cool for 10 minutes before serving. Really nice! I ate it until I couldn’t eat any more. We had it with ice cream too which was a perfect combination. Very well received all round, more please!